In Saline Joniche, on the southern tip of Calabria, SEI s.p.a. presented a project to build a 1320 MW coal-fired power plant. SEI S.p.A. is a company held by the Swiss Repower Group (57.5%), the Hera Group (20%), the engineering company Foster Wheeler Italiana S.r.l. (15%), and the investment company Apri Sviluppo S.p.A. (7.5%). Coal will be procured on the international market and delivered by sea through the Saline Joniche port. The installation is designed to process locally produced biomass in addition to burning coal. 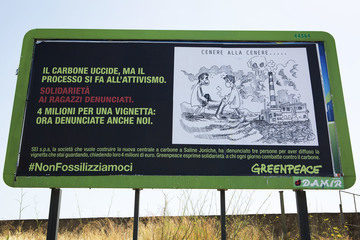 The project generated widespread opposition among environmental associations, citizens and local institutions both in Italy and in Switzerland. 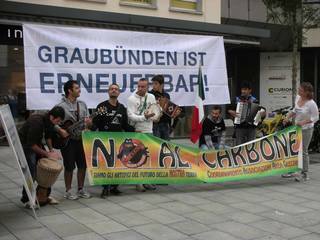 A powerful mobilization occurred in Kanton Graubünden, the home region of Repower. In 2007, the Coordinamento delle Associazioni dell'Area Grecanica (coordination of associations of the Grecanica area) was created with the aim to inform and raise awareness on the risks and problems related to the coal power plant. The mobilization stressed on the negative environmental and health impacts of the coal project and called for a sustainable development for the region. 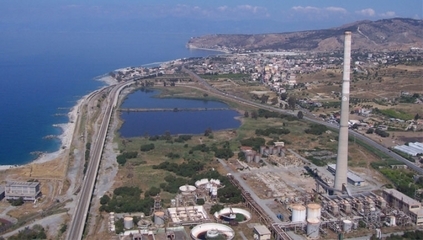 Moreover, the plant will be located in the old industrial area known as Liquichimica Biosintesi, built in the 1970s and immediately abandoned. The industrial project was strongly supported by ‘Ndrangheta (local Mafia) that benefitted a lot with it. The risk of criminal infiltration is extremely high for the new installation as well. The lack of jobs and economic resources in the area is a strong issue, which is why a few groups have sprung up in favour of the project, which is seen as an opportunity for economic growth. In June 2012 the Monti government issued a decree declaring the environmental compatibility of the project, and in April 2013 the Italian Ministry of the Environment also formally concluded the environmental impact assessment. The approval process will be complete with the granting of an "autorizzazione unica", where the region of Calabria plays an important role. In 2012 local associations and then Greenpeace, Legambiente, LIPU e WWF presented appeals to block the authorization for the new plant. The Ministry of Cultural Heritage, the Region Calabria and local authorities also disapproved the project. In particular, the Region presented two appeals to the TAR Lazio to annul both decrees presented by the government and by the Ministry of the Environment. The Region opposes the project following the directions of the Regional Energy Plan (2005), which prohibits the construction of coal-fired plants in the territory and point to energy production from renewable and sustainable resources . Moreover, as attested by the Energy Plan data, Calabria produces nowadays 'more' electricity than it consumes. Resistance also gathered form in Kanton Graubünden, Switzerland. That Kanton owns about half of Repower's shares. This semi-public ownership status allowed resisting activists to refer to the corporation's direct liability to the public. 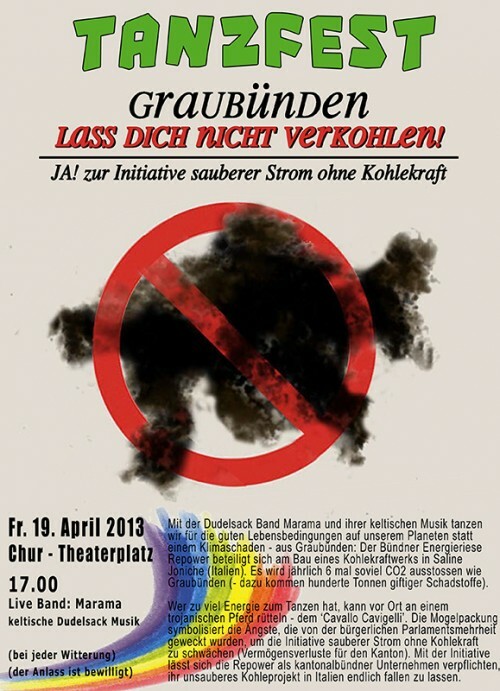 Around 2008, activists began to spread the news of Repower's coal-plant aspirations (which first involved another coal plant project in Brunsbüttel, Germany), to contact various stakeholders, form a civil association for 'a future without coal', and send editorial letters to local newspapers. In 2011, they organized a podium discussion and got the press and a TV channel to cover the story extensively. They also informed senior national scholars about the case, 24 of whom published an open letter expressing their opposition to coal-based energy. 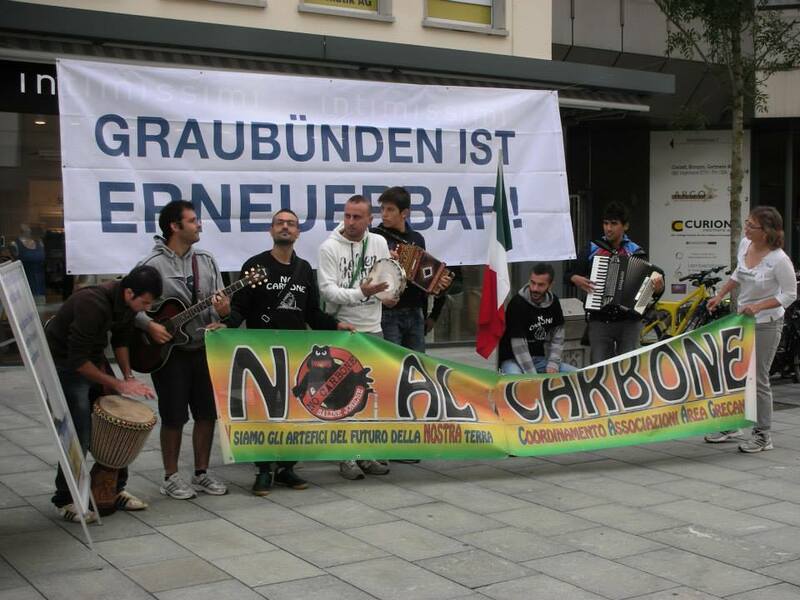 Public opinion polls were commissioned both in Calabria and in Graubünden, which showed a clear rejection of the power plant project by both populations. Thereupon, a coalition of activists, NGOs and political parties decided to launch a plebiscite demanding the local government to disavow of any coal-based energy projects in general and to forbid publicly (co-) owned companies to invest in those in particular. Supported by a sustained and inspired campaign, this demand won in a public vote on 22nd of September 2013, in spite of a strong, almost unanimous stance of the local economic and political elites in favour of the coal plant. 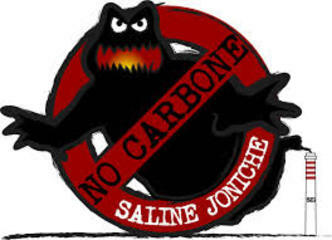 Repower then pledged to retract its investments from Saline Joniche by 2015. Following those events, in spring 2014, in Italy, local and national resistance groups started to lobby the public multi-utility Hera based in Emilia-Romagna, asking the withdrawal from the project. Project Details The Ultra-Supercritical project consist in the construction of two 660 MW plants; a covered coal bunker with a storage capacity of 300.000t; accumulation areas for ash, gypsum and limestone; two 35 km power line (380 KV) will bring electricity produced to the National grid. In addition, the project includes structural interventions on the Sant’Elia port, amounting to 50 million euro. SEI spa requested a 50 years grant on the port areas for the realization and management of a marine terminal at the service of the coal power plant. The company will use for its activity approximately 25% of the port surface. The new plant has been projected with the plan to include in next years the Carbon Capture and Storage (CCS) system. The construction works will last 50 months. Environmental justice organisations and other supporters From Italy: Coordinamento delle Associazioni dell'Area Grecanica (nocarbonesaine.it), Greenpeace Italia (www.greenpeace.org/italy/it); Legambiente (www.legambiente.it); WWF Calabria (calabria.wwf.it/); LIPU (lipu.www.lipu.it/‎). The mobilization has gone beyond Italian borders, at 1000 km away from Saline Joniche, to Kanton Graubünden in Switzerland. The two campaigns against the project exchanged information and shared strategies to coordinate efforts. The Calabrian committees travelled to Switzerland to raise awareness about local situation and vice versa to testify in Calabria supports and outcomes of the Swiss mobilization. The Swiss campaign used several forms of mobilization including public letters to the energy company signed by senior Swiss scientists, conferences with representatives from South America whose populations are locally affected by coal mining projects, the involvement of politicians and NGOs, open letters to local newspapers, demonstrations and artistic public protests. The campaign then organized a plebiscite that demanded to deny publicly co-owned companies (such as Repower) any right to invest in coal-fired power plants. Saline Joniche is located in an area affected by seismic and geological activities. The Carbon Capture and Storage system, if implemented, could increase the risks of earthquakes. Italian legislation prohibits the use of CCS systems in highly seismic areas . Other A greek-influenced dialect is still being spoken in that region and architecturally, there are also greek-influenced cultural heritage sights, so that it became known as Area Grecanica. It also has landscapes of particular beauty. Various economic 'development' projects have been pursued there that have ended as ruins, because the money was siphoned away to the Mafia. More recently, the region has made important strides at protecting it's landscape, engaged in efforts at renaturation of rivers etc. and is working towards recognition as world cultural heritage sight. In May 2014 SEI spa litigated against local activists for the diffusion of satirical cartoons and informative flyers against the project, saying those cartoons were damaging the image of the Company. The request for damages amount to € 4 million. 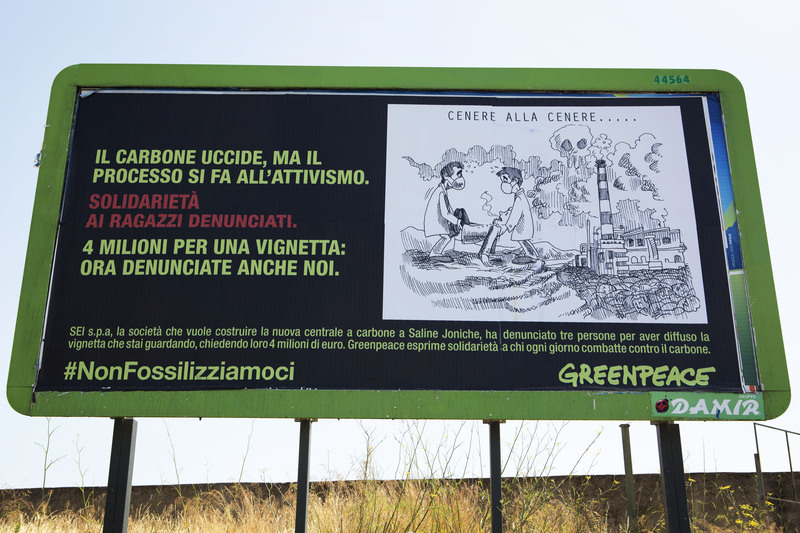 A few months after, during a campaign against fossil fuels, Greenpeace affixed in Saline Joniche the incriminated images to challenge SEI spa. Development of Alternatives The province, the university and local associations, presented few alternatives for the restoration of the industrial and port area. The desire for a sustainable development for the area has emerged through various proposals as the idea of creating a new tourist port or the proposal to create a protected marine park. Unfortunately, none of them has yet been seriously considered. Why? Explain briefly. The conflict in Italy is still ongoing and, therefore, the success so far unclear. The Swiss part of the campaign was clearly successful, because popular resistance forced Repower corporation, the main investor, via a legally binding plebiscite to withdraw its investments from the coal plant. In Italy there has been a gradual strengthening of the participation and the use of various forms of mobilization. The authorization process for the plant is still in progress, but whether and who may be financing it remains unclear.